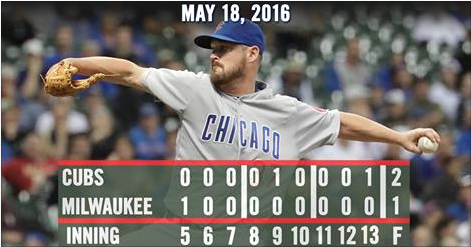 What Happened: I fell asleep some time after the 11th inning. But apparently the Cubs won. Hooray! According to my phone, it happened on a...bases loaded Travis Wood walk? HAAAHAHAHAHAHAHAHA! That's the most Milwaukee way to lose a game in the history of Milwaukee losing games (it's a long history)! AND the Brewers loaded the bases with 0 outs and didn't get anything out of it? This is PEAK BREWERS. Game MVP: Today's award was all ready to go to David Ross for gunning down a thousand (seriously, look it up) Brewers on the basepaths last night, but I gotta give at least a share of the award to Travis Wood who not only came into a bases loaded, 0 out game, but escaped without giving up a run. That's the equivalent of picking up a 7/10 split in bowling. And to top it off, he drew a bases loaded walk to score the go-ahead run in the top of the 13th. I'm as far from being a major league pitcher than anyone, but I gotta believe that with the bases loaded and a pitcher at the dish, on a full count you would be like "Well, I should probably make sure to get this one over the plate and see what happens!" Game LVP: I can't quite say that I disagree with a lot of what Joe Maddon does, but he does have an annoying habit of taking players out of the game when I don't think he has to. He pinch ran Baez for Rizzo in the 9th inning. Yes, Baez is faster than Rizzo, but Rizzo is a great baserunner for a man his size and in the end Baez's speed wasn't even a factor. Then again, Joe Maddon is being paid more than I'll ever make to decide those things, so who am I to criticize? So About Those Cubs Bats...: Let's address the elephant in the room: the Cubs have been completely shut down over the last 2 days by Chase Anderson and Jimmy Nelson, who are not what anyone would call "solid". I think that part of it is that both of them pitched really well. The Cubs haven't looked bad necessarily, and I do think that Anderson and Nelson pitched at about the best of their abilities. Hey, even the hottest teams cool off and have a stinker every once in a while. Six months...three over .370 OBP, three under .300. Remember going into the playoffs last year when there was talk of benching Fowler in September? I think what you're seeing now is what the Cubs offense might have looked like those first few weeks in April when Bryant/Rizzo/Zobrist were ice cold if Dexter hadn't been playing out of his mind. It doesn't mean that the Cubs aren't still the best lineup in baseball, because I firmly believe that they are. I'm just saying that we have to remember stretches like this happen, and when your leadoff guy cools off, it makes it tough on the whole lineup. And it also doesn't help that our #2 hitter is almost non-existent on the offensive end. The Cubs try to take the series from the Brewers at 12:40 CST with Jason "Great Before July" Hammel going against Javy "Who?" Guerra. It would be great for the Cubs to finally flex the pecs against the Brewers and put up 5-6 runs like we're used to because we've been spoiled so far this season.